Mike Mertz loves coaching and teaching — a passion and responsibility that he is deeply devoted to. As a travel fastpitch head coach, Coach Mertz’s teams have been accepted into several top college showcases. Atlanta Legacy, Diamond 9 Sun Classic, Champions Elite 90 (GA), Team NJ and more. In addition, his teams have placed in the top tier at the ASA/USA Nationals, won an ASA Region 3 Championship, earned a 16U ASA Hall of Fame national berth to OKC (as 14U team), won an ASA Virginia State Championship, and finished ASA Virginia and NSA State Runner Up. In addition to coaching, Coach Mertz also instructs dozens of young pitchers in the Northern VA Region. 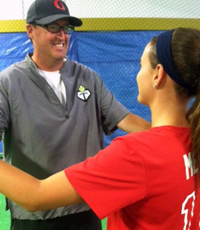 Working closely in tandem with his mentor, Denny Tincher (father and coach of Angela Tincher, 2008 College Softball Player of the Year), Mike became the first Certified Tincher Pro Staff Instructor in the country and frequently leads group clinics as well as assisting Coach Tincher at college clinics. Mike played baseball for #2 ranked New Trier High High School and Hall of Fame Coach, Ron Klein, in the Chicago area. Following his transfer to Lake Forest Academy, he was honored as a two-time first team Independent School League selection and earned 2nd team All Met Chicago (.579 AVG and compiled a 5-1 pitching record including a 16 strikeout performance in a 7 inning game). Mike also attended several elite baseball camps including summer hitting camps run by University of Arizona Hall of Fame coach, Jerry Kindall, as well as the Fort Lauderdale Baseball School. Following high school and American Legion ball, Mike later pitched in college summer leagues and played high level softball for 20 years. Throughout his playing career, Mike played every position on the field – including 8 years of catching – which gave him great insight into the game along with the leadership skills that led him to coaching. Mike attributes his love for coaching to his grandfather who coached both him and his father as well as some of the top mens softball teams in the South—regularly competing in regional, national and world tournaments. Idolizing those teams as a young boy is where it all began — his pure love and respect for the game and his passion to give back to something bigger than himself. His day job? Owner and Chief Creative Director of Mertz Alliance Mighty Creative, a national award-winning advertising and design firm. I met Denny at a pitching clinic in Northern VA. My daughter and I spent four hours learning about how almost everything that we had been taught for the past three years was completely debunked by science and sports medicine. This was not a matter of one instructor being right and the others wrong — after all, coaching styles and philosophies differ at all levels of all sports. This was a master class in female biomechanics and gaining a much clearer picture of how the female athlete transfers maximum energy…and my daughter was ecstatic to feel the immediate difference. It was my first glimpse into TINCHER FLUID DYNAMICS and I was hooked. In fact, I took my daughter home, then drove back to the facility and humbly asked if I could pull up a bucket and watch his next three hours of lessons. Long story short, after 70+ hours of co-instructing lessons and working camps alongside Denny, I was honored to become the very first certified TINCHER PRO STAFF INSTRUCTOR in the U.S. And I just couldn’t be more excited to continue this journey into developing a new generation of female pitchers. In my mind, the TINCHER FLUID DYNAMICS form is THE single most important advancement in pitching since girls fastpitch began over 30 years ago. This form will rewrite pitching mechanics just as Angela Tincher re-wrote college record books. All 5’7″ of her — which is just astonishing. I also firmly believe that it will significantly lower the vast number of injuries we see in the game. I strongly encourage everyone reading this to start by asking more questions and to then explore TINCHER FLUID DYNAMICS. Here is what Denny says about Coach Mertz: Mike brought his successful business approach to pitching. He is analytical, curious, systematic, innovative, and always asks a lot of questions. He is never satisfied until he understands the movement patterns for each pitch completely. Mike always has fresh ideas and constantly looks for better ways to help pitchers understand what they are trying to accomplish. Yet, each pitcher is an individual to Mike, and he tailors the approach to fit her unique build and personality.